Looking for excellent carpet cleaning services in Bounds Green N11 area at a reasonable price? We have just what you need – a team of fully vetted and insured carpet cleaners certified. With us you get a 100% clean guarantee, our Bounds Green N11 carpet cleaners simply wont leave your home until satisfactory results is achieved! Call Magic Carpet Cleaning on 0208 861 0979 now for free no obligation quote, free carpet cleaning advice and custom offers and prices for Bounds Green, Haringey N11 residents and businesses! Bounds Green N11 carpet cleaning services: We cover all areas. We can now confirm that we fully cover the Bounds Green (N11 and N22 post code areas) in Haringey, North London and that we provide quality carpet cleaning services you won’t find anywhere else. We cover all the Borough of Haringey and we are also available, even on short notice, in Bounds Green, N11 and N22 postcode areas. We’ve been providing great carpet cleaning services in Bounds Green N11 for the past seven years. We have carpet cleaners who are fully trained to our industry’s standards and who can tackle any job regardless of size and difficulty. Our cleaners also have full insurance and are fully qualified to use our expert dry carpet cleaning and steam carpet cleaning equipment to ensure that the quality of job they do for you is second to none. We also provide upholstery cleaning services in Bounds Green, Haringey, covering all the N11 postcode areas. With well over seven years of experience in the upholstery cleaning services, you can rest assured that our teams will do a great job, one that’s hard to be matched by our competitors. Furthermore, should you be unhappy for any reason of our upholstery cleaning services, our cleaners in Bounds Green will re-visit your property in the N11 area and they will re-clean, for free. Another popular Magic Carpet Cleaning service in the Bounds Green, Haringey N11 is the stains removal service. Just to make sure that we do a great job removing stains, our carpet cleaning technicians carry around 15 different types of chemicals to tackle any stain, regardless of age or the type of fabric it’s been left on. From this perspective, no stain is too large nor too small and it can be easily removed by our Bounds Green cleaners. Also, please keep in mind that some stains may be too difficult to be removed, depending on they composition and age, so do please give us a free call on 0208 861 0979 to assess and discuss all the avenues of getting those nasty stains removed by our technicians. 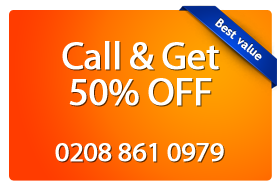 Our famous “satisfaction guaranteed or we re-clean for free” offer which is available to Bounds Green private individuals and businesses alike. Call 0208 861 0979 now for honest, quality, free carpet cleaning advice and free quote with no obligations, or to book your service with us in Bounds Green, N11 or N22 areas, Haringey, North London.